The sacrifices of OFWs to give their loved ones a better life is nothing short of heroic. As they toil thousands of miles away, OFWs need all the assistance that can be made available for them to make sure that every single centavo they earn is sent back home swiftly and conveniently. Don Torres, 45, an I.T. expert who has been working in Singapore for three years now, says: “Every single moment I spend away from family makes me homesick. But what keeps me going is the knowledge that what I earn guarantees a better life for my loved ones. And to know that there are entities that can be relied on to make sure they receive the money as soon as possible eases my worries”. His sentiment is echoed by Carlita Anondres, 34, an English teacher based in Hong Kong who regularly sends out money to her parents in Leyte. She says: “The happiness I feel whenever I send them money is unexplainable. It is a great feeling to be able to give back to the people who have sacrificed so much to put me through school”. Don and Carlita are just two of the thousands of OFWs, who can now count on a more convenient way of sending their remittances to their loved ones here in then Philippines. This comes after LBC and iRemit signed their partnership which allows remittances sent via the latter to be encashed at all LBC branches nationwide. 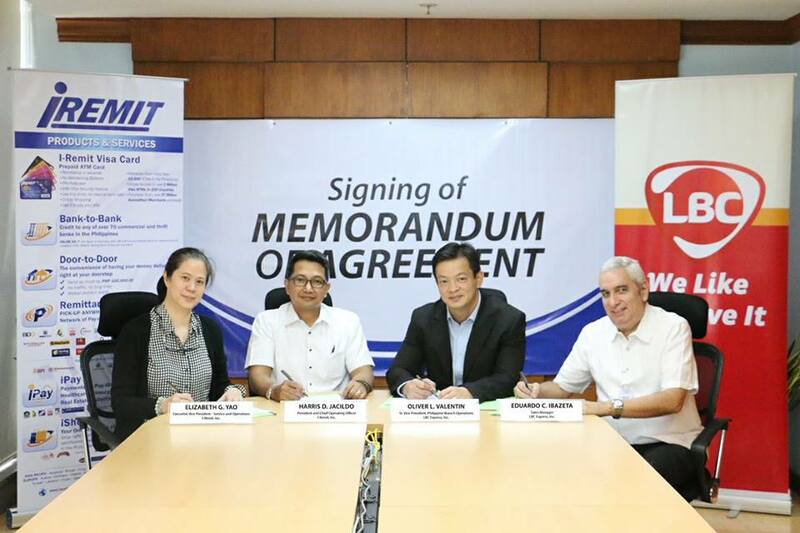 Present during the signing of the agreement were: Elizabeth G. Yao, Executive Vice President - Service and Operations I-Remit Inc.; Harris D. Jacildo, President and Chief Operating Officer, I-Remit, Inc., Oliver L Valentin, Sr. Vice President, Philippine Branch Operations, LBC Express, Inc.; and, Eduardo C. Ibazeta, Sales Manager, LBC Express, Inc. The enhanced tie up is expected to immensely benefit OFW families as the two companies have long been reputed as leaders in their respective fields: LBC, as a leader in Business Logistics with the widest network of more than 1600 branches globally; and, iRemit, as the largest Filipino-owned non-bank remittance service provider which boasts of more than 1000 remittance outlets in 26 countries.